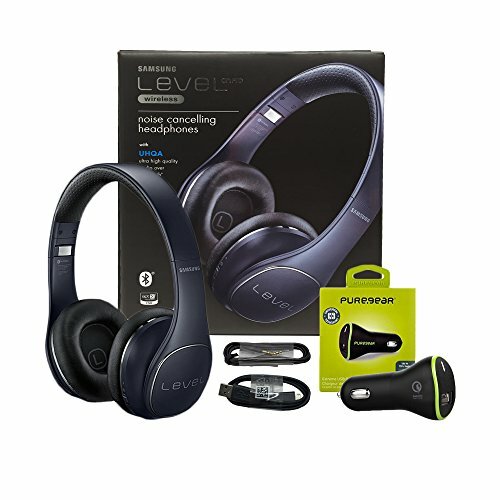 View More In Bluetooth Headsets - Page 2.
ouch Controls and Sound Share Smart Command Touch Controls keep music and phone controls easy, intuitive and right at your fingertips. Talk-In Mode allows you to turn ambient noise on or off while listening to audio. Ideal for situations where outside sound is helpful - like when using public transportation. Sound Share allows you to share your streaming audio with a second Level On Wireless PRO, Level On Wireless or Level U PRO headset.Style and Performance Designed with premium materials and finishes, the Level On Wireless PRO conveys prestige and quality. The convenient foldable frame makes them easy to carry and store while the lightly-tensioned headband makes them perfect for long-term listening.Samsung UHQA Studio Sound Ultra High Quality Audio (UHQA) technology delivers a true 24bit digital audio experience with up to 2x wider frequency range than standard CD-quality wireless sound. Combined with Active Noise Cancellation, listeners experience vivid, concert hall sound. UHQA is compatible with select Samsung Galaxy devices. If you have any questions about this product by Puregear Samsung, contact us by completing and submitting the form below. If you are looking for a specif part number, please include it with your message.